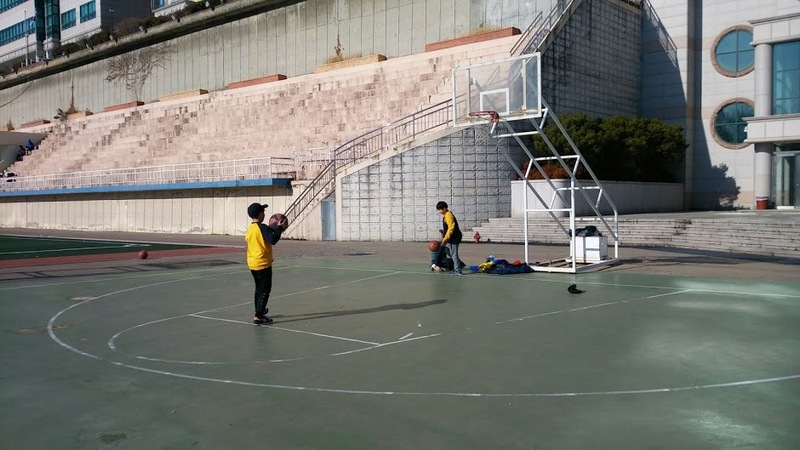 Looking for a place to play basketball in western Seoul? Head to Soongsil Middle and High Schools. They share a campus and have a nice collection of athletic facilities available for use. Among them is a basketball court. 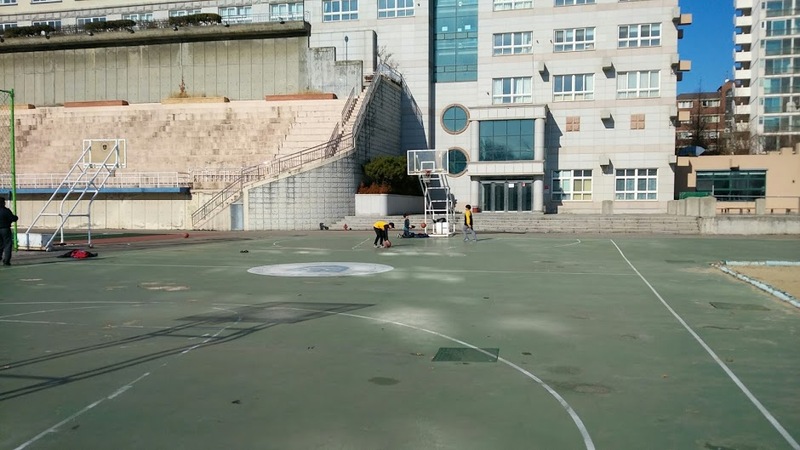 At Soongsil Middle and High Schools' shared campus, 1 and 1/2 courts can be found in a nice secluded location. It is a great place to bring a crew of friends and play some basketball. In addition to the 1 full court, the 1/2 court is excellent for having a small shoot-around session. Hey, even Dirk Nowitzki has to warm up before taking the court. So should you. In a very secluded location. Great place to bring the players and take advantage of the often empty courts. If you're looking for some pick-up, you'll have to head elsewhere. The pick-up games do not travel here often. It is not well lit. Bathrooms and change rooms are located underneath the nearby stands. To see more photos, check out the Soongsil Middle and High Schools basketball photo album. 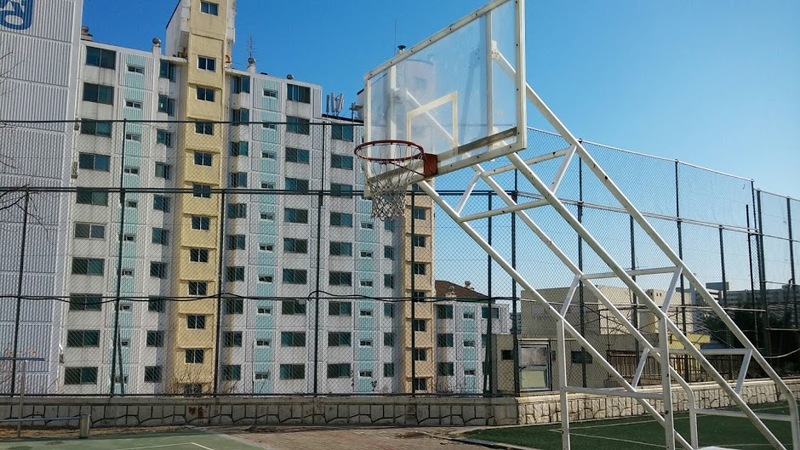 -The basketball court is 1.5 kilometers from the station. Come out of exit 4. Walk straight 70 meters and take a left. Walk for 900 meters. You will take a left at a street named Eunpyeong Tunnel-Ro. Walk straight for 500 meters. When you pass a bus station named Hyundai Apt. Front (Bus Stop ID 12-337, 12-336) you will know you are close. Take a right at a street named Eunpyeong Tunnel-Ro 7 Gil. You will walk uphill past an opera school. Keep going uphill and follow the green fence. You will find yourself in front of a church. The soccer field parking lot is to your right. The basketball court is on the other side of the soccer field.